IT Management: Desktop sales outnumbered smartphone sales. Mobile internet traffic was 1% of overall traffic. Tablets did not exist. Desktop sales outnumbered smartphone sales. Mobile internet traffic was 1% of overall traffic. Tablets did not exist. This distant point in time was 2009. Fast-forward four years, to 2013. The world changed. Mobile now accounts for over 12% of overall traffic. Smartphone sales have eclipsed desktop sales. Tablets not only exist – but 122 million of them were shipped last year. The future is mobile. That much is clear. But, we are only in beginning stages of this mobile revolution. Fast-forward just two years from now: 1.6 billion smartphones, and 440 million tablets, are expected to ship. 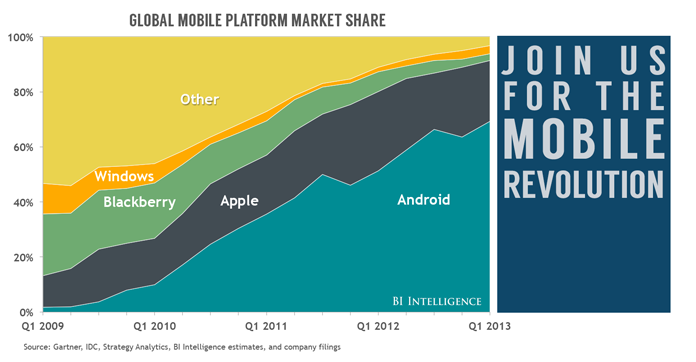 Mobile usage of all kinds – commerce, payments, video – will explode further. Consumer behavior and mobile advertising will evolve radically. And desktop sales will continue to experience a slow and steady decline. This says nothing of the potential meteoric rise of wearable devices, such as Google Glass. This kind of radical and rapid change is nearly impossible to keep up with. It’s even harder to actually make sense of. This is why we started BI Intelligence, Business Insider’s research and subscription service, in 2012. At BI Intelligence, we are focused entirely on the mobile ecosystem. We consume and interpret every piece of mobile news, so you don’t have to. Our data-driven insights and analysis come every day, in many forms. We deliver research reports, charts, data, newsletters, and news notes on every topic and industry that is affected by the mobile revolution. We offer a service that is customizable, downloadable, and searchable. Our members span across many industries – including advertising, marketing, financial services/venture capital, consumer internet, computer software, online media, and management consulting. Many of our members are senior executives or managers, responsible for large companies or teams. Nearly 100 of Fortune 500 companies are represented in our membership ranks. The reasons why are simple. BI Intelligence keeps its members ahead of every key trend and development in mobile. As a result, our members make smarter strategy decisions. You can experience the value of BI Intelligence yourself without any commitment whatsoever. Sign up for a free 14-day trial and receive full access to everything we have to offer. You can sign up to receive all of our new content via email, or search through our dozens of research reports and hundreds of charts and data sets – all at no cost. At the end of your trial, you’ll have the option to subscribe to an annual membership for $399. The question is not whether you can afford to try BI Intelligence – our trial, after all, is free. The question is if, with the mobile revolution that is under way, you can afford not to. Sign up for your free trial today and discover what BI Intelligence is all about.